It's summer and, for once, we really have had some summer weather. I find that I am less motivated to cook when it is warm so simple, throw it all in one pan, recipes are very appealing...oh wait...simple, throw it all in one pan, recipes are very appealing to me all year round! 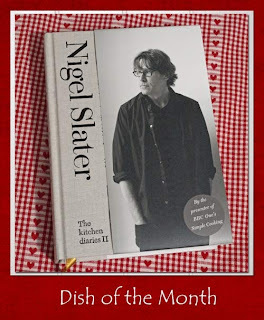 Nigel Slater is noted for the simplicity of his recipes, he cleverly combines a few key ingredients to create delicious dishes you want to make again and again. 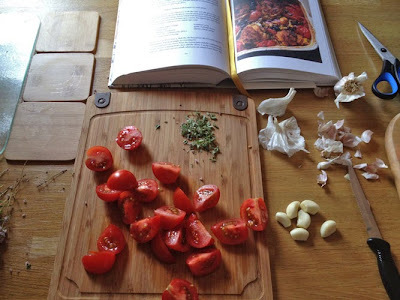 The August chapter of The Kitchen Diaries II features a number of ingredients that are not quite ready yet in Scotland, but tomatoes are at their peak and I can hardly keep up with my pots of herbs as they are loving the warm weather. 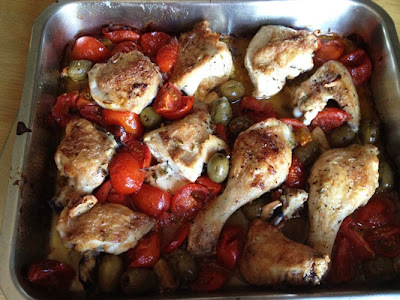 Nigel suggests chicken thighs for this recipe, but I bought a whole chicken and jointed it, I also used some green olives rather than the black ones in the recipe as I had half a jar left over from another dish. 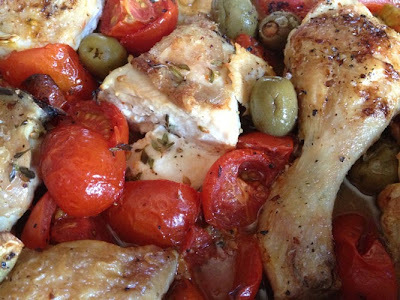 It's a great recipe, just brown the chicken and throw in the tomatoes, garlic and olives and thyme. put it in the oven and leave it to cook. I did cover it with foil after about 10 minutes because the olives were drying out, the chicken was lovely and moist and the we mopped up the juices with some mediterranean bread. 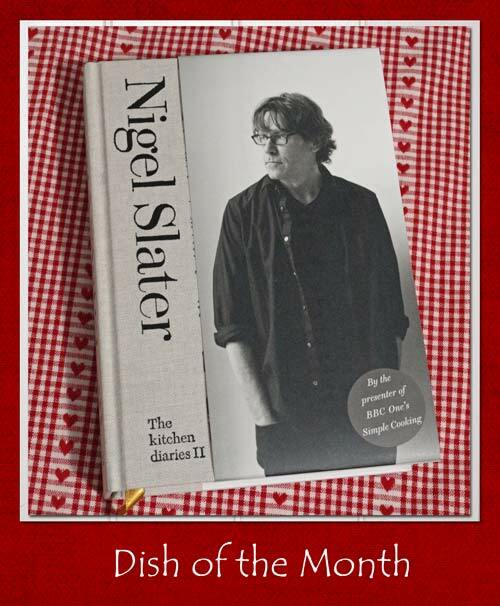 Enter Dish of the Month in August for a chance to #WIN a copy of Nigel Slater's Real Fast Food. 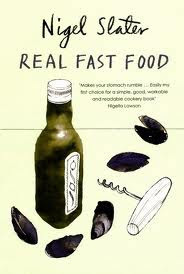 This is a classic Nigel Slater book suitable for beginners and experienced cooks. This giveaway is run in good faith and only open to those resident in the UK. The winner will be picked at random using the random number generator. Sue, from A little Heaven on a Plate, and I will be excluded from the draw. I jointed up a chicken the other day into the freezer..I can see your recipe being made next week as we have nearly everything in the cupboards, plus looks delicious! Would of had the tomatoes too if the dearest hadn't 'lost' them on way home from shops..! Anne - hope you managed to make and enjoy this dish.